I am highly distractable. I am not the sort of person who plugs away at a project until I finish it before starting something new (unless someone is breathing down my neck) because while I’m working on one thing, I’ll look over at a piece of fabric that is just begging to be turned into another project and I’m onto something else. So while I DID putter a bit on the Bonsai Bag Pattern this week, I also spent an afternoon making a mini-Lickety Split Bag (Update: The Lickety Split pattern is no longer available). The fabric is Alexander Henry’s Spotted Owl in grey. I have the pale blue colorway too but the grey seemed perfect for fall. I also have a seester who had a birthday who I suspected might like this. But I might need to make a few more of these bags so she can pick her favorite, you know, like a multiple-choice-birthday gift. Making gifts for fambly is tricky because I have a tendency to make things based on my taste and not necessarily theirs. So options are always good. 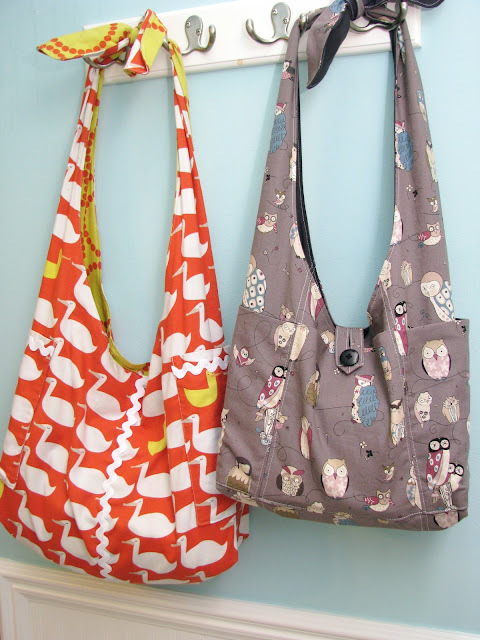 Just so you can see the difference between the actual Lickety Split Bag and this version, here they are side by side. Even though you can’t tell in this picture, the straps are actually the exact same length (I think the knots are a little different) but the body of the mini version is shorter and narrower. can you believe I made these from the same pattern? I used my Lickety Split pattern (Update: The Lickety Split pattern is no longer available) and with the following changes to the main pattern piece: chopped off the bottom 2.5″ of the pattern piece and the middle 2″ and tossed those two pieces. 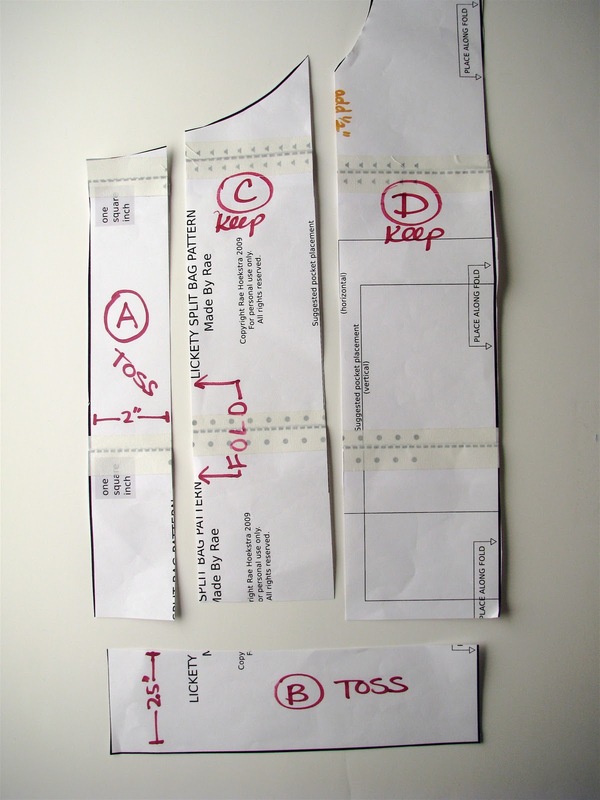 The remaining pattern piece was cut along the line for the horizontal pocket placement as shown, creating the two pieces labeled C and D below (click photo to enlarge). The center piece labeled “C” was cut on the fold where indicated, with an additional 1/2″ seam allowance added on the taller side of the pattern piece (right side in photo). The strap piece labeled “D” was cut on the fold with an additional 1/2″ seam allowance on the shorter side of the piece (left side in photo). The pockets were cut as wide as each section and 16″ tall. Each pocket was sewn together by folding in half lengthwise with right sides facing and then sewing across the bottoms (leaving the sides open). Then turned the pockets right-side out, and placed them 3″ from the bottom of each panel and sewed across the bottoms to fasten securely to each panel. Then basted the pockets to the panels along the sides and then sewed all the panels together. I topstitched each seam with a double row of stitches. I added a button loop (a 2″ strip folded into a 1/2″ strip and sewn along both edges), and two buttons, one inside and one outside so it can be fastened when reversed. The lining pieces are cut just the same as the outside and then the bag is assembled exactly the same as the instructions indicate. I think I like the size of the "mini" better and I definetly love the fabrics on both, the grey a smidge more!!! really nice!!! I like the mini version better. 🙂 Your sister is lucky! Yes, I like the mini-version much better too! Looks great – love the owls fabric. So super cute! And who couldn't use a new handbag?!! Love it! Oh Rae, the Bonsai bag is a cutie , but I think I like the looks of both those Lickety Splits – regular and mini – hands down. I may have to break down and spend a little of my hard earned $$ to order that pattern from ya! It's like a whole new pattern – I love it! i love it!! you don't need to make more choices. i am a lucky sister indeed!! What a perfect use for some gorgeous fabric! I love this!!! Thanks so much for sharing the modifications – I think I might give it a try! i too have the blue. now i love the gray. i want that bag. it is totally hot. love the outside pockets. LOVEIT. you rock mama ! LOVE the mini! Very cute. Ooh! I love this bag and the fabric is incredible. What a fun way to use the pattern. And, um, thanks for stopping by my blog. I may or may not have danced a little jig. super cute! 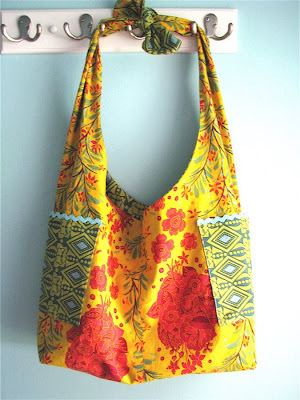 Love the fabric and the bag! I am so happy I didn't cut out pattern pieces last night, now I will try to make this one first. Such gorgeous fabric! Thanks for the how-to! Very cute bag! I love fabric choices. I LOVE the modifications…very mom friendly yet it doesn't necessarily look like a mom bag! I really like my LS bag, I am using it daily and it has, in actual fact, replaced my (new…!) leather store-bought handbag. But there is/was one thing that bugged me, and that is that the seam runs right through the middle of back & front, thus cutting up the pattern of the fabric. So I was thinking of perhaps making another one, only this time I'd line up the "center front edge" with the fabric fold, so that the seam would run through the sling arms and not through the back. I think that fabric is absolutely fantastic. I am so loving it. It's the cutest thing I've ever seen. I agree with the others… I think I like the mini version better too! Nice job! 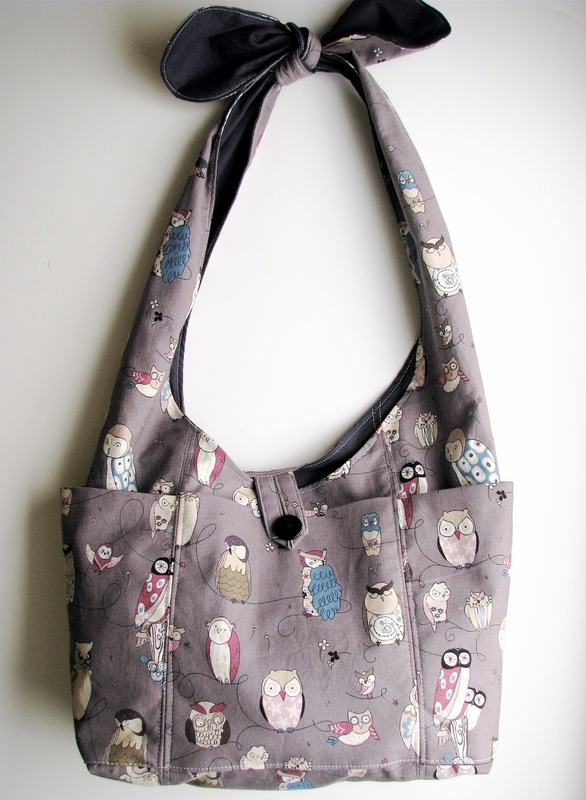 I am positively drooling – i like this version of the LS bag better i think, and i absolutely lurve the owls. so gorgeous! I do not mean to seem clueless and you did a GREAT JOB explaining, but as a brand new sewer (who has barely mastered the original) could you make the pattern for us to print? In your spare time (ha, ha!). Only anonymous because no time to figure out how to not be- have to make a bag for mother-in-law by Friday so sewing away! Oh my gosh- I think I did it! Thanks for your support- no need to load the pattern. Love your blog- especially completely new to sewing! i love it. the material rocks too! ummm… I don't know what this says about my Friday nights, but after having had a glass of wine and seeing the pattern Friday night I immediately bought the fabric from Hawthorn Threads (and some in other colorways and some dots for the inside…). I was convinced that the fabric would be gone if I waited! I already have the pattern (made for my daughter in Heather Ross horses) and can't wait to make the owl bag for me – THANKS! Quick question. Did you use home dec weight or quilters cotton? It appears to hold it's structure in the pics much better than the original. Question: I have the original pattern (sewed it twice) and am trying the new version. My pockets end up 7.5 in. tall; when I place them 3 in. from the bottom of each panel per instructions, they are too tall for the center panels and do not appear like your photo (with a gap between top of pocket and top of bag). What am I doing wrong? So I just went and measured mine; my pockets are 7.5" tall too; but I attached them to the panels before sewing any of the seams (so they were attached 3" above the bottom before the bottom seam got sewn). I ended up with a little less than an inch between the top of the bag and the top of the pocket. Another thing that might help: on the finished bag there is 2.5" from the bottom seam of the bag to the bottom of the pocket. How tall is the center of your center panel piece? Maybe that needs to be taller? Another fix for the problem you are having is just to make the pockets shorter or place them a little lower on the bag. Yes it's just quilter's cotton; it's definitely more structured because of all the pockets that go all the way around that are double-layered. You could do this w/ home-dec though too, it would stand up on its own!! 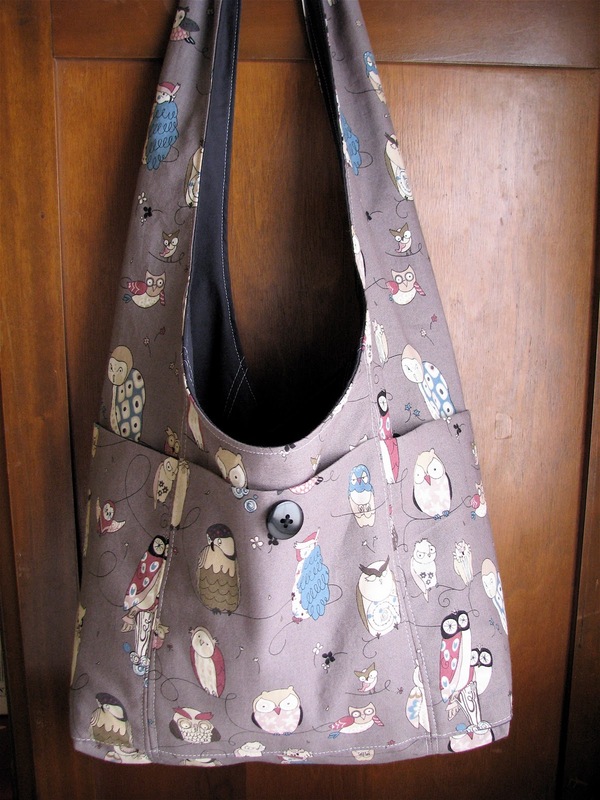 When I saw this bag I nearly swooned – and immediately went and ordered the fabric. Today it showed up in in the mail, and I'm so excited to try your mini-bag version! Thanks so much for the idea and the pattern! Just a quick question, I'm in the middle of making this bag. SO looking forward to using it. And was wondering whether or not you have a pocket in the back centre on the outside? Just not sure what I sure what I should do with that bit. Hi Amy: Yes the bag is exactly the same on the front as the back (in other words, there's a pocket basted to all four panels before you sew them together). Hope that helps! Did you put a button on the inside for total bag reversal? Love this version of the bag! I bookmarked the page, may come back later to order the pattern from you. 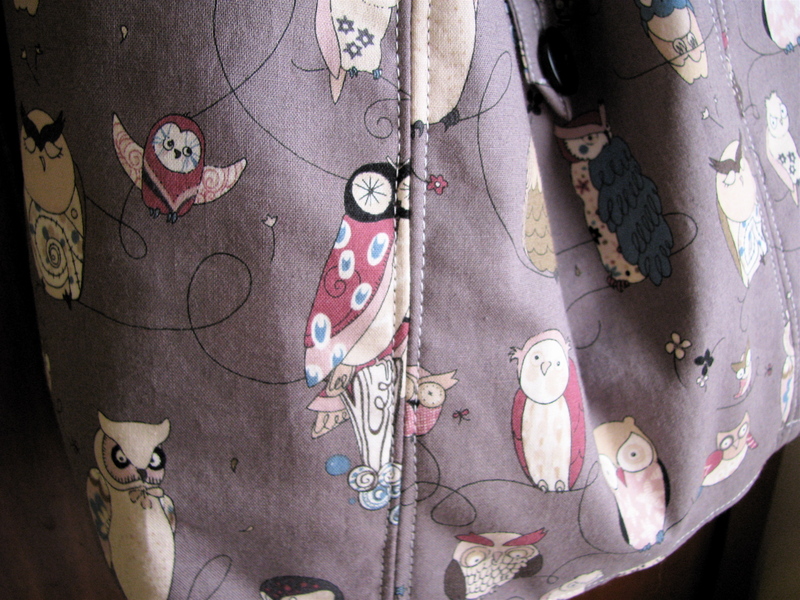 Really cute owl fabric too! 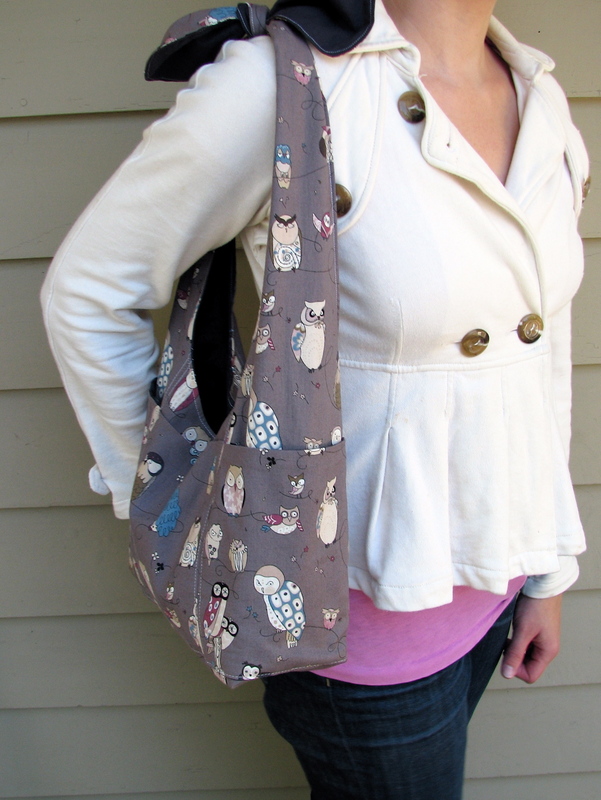 I don't normally like fabric bags but this one is so cute…I would actually carry it. Extra pockets make it more functional and it looks "sharper" I guess because pockets give more structure. Very generous of you to share your method. So, I love the buttercup bag and I've been wanting to make it. However, I saw this and now I HAVE to buy the pattern and it make it! Hi! Love this bag. Not sure I understand, is there a pattern for this, or do I have to buy the larger version and adjust it as in the pic? It’s been years since I have had time to sew…time to make time! I have the itch…so much for my job as a consultant for a DS company that sells….you guessed it, all sorts of BAGS! But they don’t have one like this, and nothing beats the satisfaction of making it yourself! could you explain how to sew the pockets? So if I fold the pocket lengthwise I am folding it in half? Which means one of the sides is the fold side and the top, bottom, and 1 side is open? Am i reading this correctly? Buyer beware… I figured my $6 pattern would INCLUDE all those tricky “cut this, remove that” directions to make the Mini-Lickety Split bag with all the cool pockets. Not so. If you are not into do-it-yourself patterns, I’d skip this purchase. I purchased downloaded and printed this pattern. Instructions printed properly but the four pattern pieces each printed on only one page each of 8 1/2 x 11 paper. 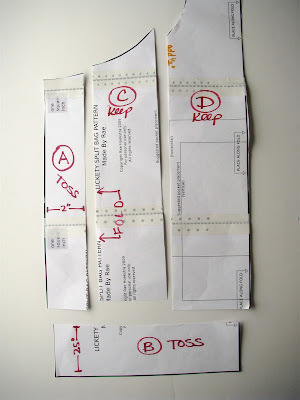 According to the instructions, it seems to state that they would be on multiple pages and that one was to cut and tape them all together to make one pattern piece. Is there something that has to be done to get them to stretch to their correct size. I hope this problem can be taken care of so I can proceed to make this lovely bag.